In the last article, we managed to get our process blocked. As stated then, the code had couple of problems. One of them being unblocking the process. There was no one to wake our process up. Sleeping process is of no use. Another flaw was that our process was sleeping unconditionally. However, in real life scenarios, process never goes to sleep unconditionally. Read on to get the further understanding of wait mechanisms in the kernel. We have the wake_up_process() API as shown below for waking up the process. As our process would be blocked, we need some other process to invoke this API. Below is code snippet which demonstrates the usage of this API. In the above example, we are using the global variable sleeping_task to hold the task_struct of the sleeping process. This variable is updated in read() function. In write() function, we use the sleeping_task as a parameter to the wake_up_process() API. When we execute the echo command, write operation gets invoked, which invokes the wake_up_process() to wake up the blocked process. What we saw in the above example was the basic mechanism to block and unblock the process. However, as discussed earlier, the process always waits on some event. The event can be some specified amount of time, waiting for some resource or it can well be waiting for some data to arrive. Below is the modified version of above program to wait for an event. In this article, we implemented the basic wait mechanism in the driver. This was more like a manual waiting where everything needs to be taken care by driver writer and as such is prone to some synchronization issues. So, this kind of manual waiting is rarely used. 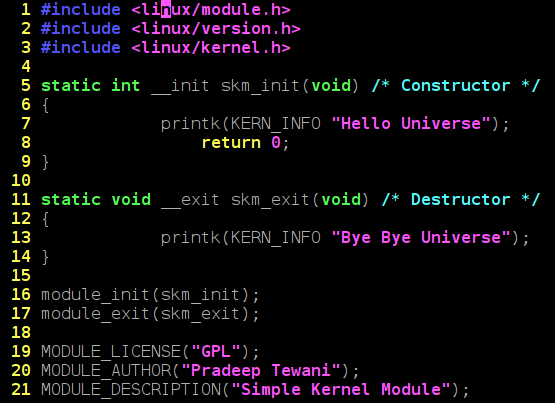 However, kernel does provide some robust mechanism to implement the waiting. So, stay tuned to my next article to learn more about the waiting in Linux driver. 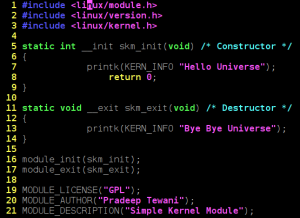 This entry was posted in Linux Kernel Internals and tagged Linux Driver, Linux Kernel Development, Linux Kernel Internals, Linux Kernel Wait Mechanism on November 1, 2015 by Pradeep D Tewani.